Pyloroplasty is a surgical procedure in which the pylorus valve at the lower portion of the stomach is cut and resutured, relaxing and widening its muscular opening (pyloric sphincter) into the duodenum (first part of the small intestine). 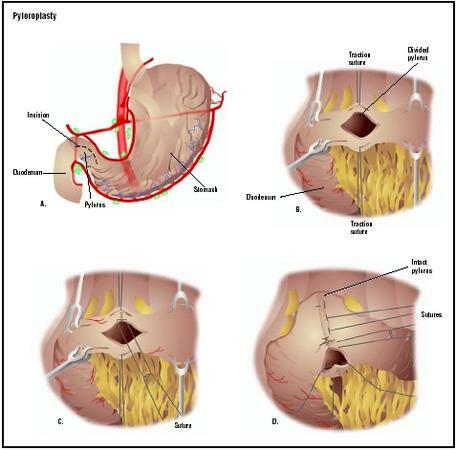 Pyloroplasty is a treatment for patients at high risk for gastric or peptic ulcer disease (PUD). Pyloroplasty surgery enlarges the opening through which stomach contents are emptied into the intestine, allowing the stomach to empty more quickly. A pyloroplasty is performed to treat the complications of PUD or when medical treatment has not been able to control PUD in high-risk patients. Nearly four million people in the United States have PUD; about five adults in 100,000 will develop an ulcer. About 1.7% of children being treated in general pediatric practices are diagnosed with PUD. The presence of ulcer-causing Helicobacter pylori bacteria occurs in 10% of the population in industrialized countries and is believed to cause 80–90% of primary ulcers. In the United States, H. pylori infection occurs more frequently in black and Hispanic populations than in white. The frequency of secondary ulcers (caused by other existing conditions) is not known as it depends on the frequency of other illnesses, chronic diseases, and drug use. Primary and secondary PUD can occur in patients of all ages. Primary PUD is rare in children under age 10, increasing during adolescence. Secondary PUD is more prevalent in children under age six. conditions that disrupt the gastric environment. Although H. pylori is believed to cause the majority of all ulcers, not all people infected with it develop ulcers. In high-risk individuals, the bacteria more readily disturb the balance between good factors and destructive factors, upsetting the protective function of the stomach and intestine lining. An ulcer develops when the lining can no longer protect the organs. Secondary ulcers are usually found in the stomach; primary ulcers can be in the stomach or intestine. Symptoms of gastric or peptic ulcer include burning pain, nausea, vomiting, loss of appetite, bloating, burping, and losing weight. When PUD is diagnosed or high risk established, medical treatment will begin to treat H. pylori infection if present and to restore balanced conditions in the mucosal lining. Any underlying condition may be treated simultaneously, including respiratory disorders, fluid imbalance, or stomach and digestive disorders. Medications may be prescribed to help correct gastric disturbances and control gastric acid secretion. Certain drugs that are prescribed for other conditions, especially NSAIDs, may be discontinued if they are known to cause inflammation. Adult patients may be advised to discontinue alcohol and caffeine use and to stop smoking. When medical treatment alone is not able to improve the conditions that cause PUD, a pyloroplasty procedure may be recommended, particularly for patients with stress ulcers, perforation of the mucosal wall, and gastric outlet obstruction. The surgery involves cutting the pylorus lengthwise and resuturing it at a right angle across the cut to relax the muscle and create a larger opening from the stomach into the intestine. The enlarged opening allows the stomach to empty more quickly. A pyloroplasty is sometimes done in conjunction with a vagotomy procedure in which the vagus nerves that stimulate stomach acid production and gastric motility (movement) are cut. This may delay gastric emptying and pyloroplasty will help correct that effect. Before surgery, standard preoperative blood and urine tests will be performed and various x rays may be ordered. The patient will not be permitted to eat or drink anything after midnight the night before the procedure. When the patient is admitted to the hospital, cleansing enemas may be ordered to empty the intestine. If nausea or vomiting are present, a suction tube may be used to empty the stomach. The patient will spend several hours in a recovery area after surgery where blood pressure, pulse, respiration, and temperature will be monitored. The patient's breathing may be shallower than normal because of the effect of anesthesia and the patient's reluctance to breathe deeply and experience pain at the site of the surgical incision. The patient will be shown how to support the site while breathing deeply or coughing, and will be given pain medication as needed. Fluid intake and output will be measured. The operative site will be observed for any sign of redness, swelling, or wound drainage. Intravenous fluids are usually given for 24–48 hours until the patient is gradually permitted to eat a special light diet and as bowel activity resumes. About eight hours after surgery, the patient may be allowed to walk a little, increasing movement gradually over the next few days. The average hospital stay, dependent upon the patient's overall recovery status and any underlying conditions, ranges from six to eight days. Potential complications of this abdominal surgery include excessive bleeding, surgical wound infection, incisional hernia, recurrence of gastric ulcer, chronic diarrhea, and malnutrition. After the surgery, the surgeon should be informed of an increase in pain, and of any swelling, redness, drainage, or bleeding in the surgical area. The development of headache, muscle aches, dizziness, fever, abdominal pain or swelling, constipation, nausea or vomiting, rectal bleeding, or black stools should also be reported. Complete healing is expected without complications. Recovery and a return to normal activities should take from four to six weeks. Successful treatment of Helicobacter pylori has improved morbidity and mortality rates, and the prognosis for PUD, with proper treatment and avoidance of causative factors, is excellent. Pyloroplasty is rarely performed in primary ulcer disease. Morbidity and mortality are higher in patients with secondary ulcers because of underlying illness that complicates both PUD and surgical treatment. Monahan, Frances. Medical-Surgical Nursing. Philadelphia: W. B. Saunders Co., 1998. American Gastroenterological Association. 7910 Woodmont Ave., Seventh Floor, Bethesda, MD 20814. (301) 654-2055. http://www.gastro.org . National Institute of Diabetes and Digestive and Kidney Disorders. 31 Center Drive, Bethesda, MD 20892. (301) 496-7422. http://www.niddk.nih.gov . "Peptic Ulcer Surgery." Mayo Clinic Online. March 5, 1998. http://www.mayohealth.org . "Peptic Ulcer Disease." Inteli Health. Harvard Medical School and Aetna Consumer Health Information. March 6, 2001. http://www.intelihealth.com . A pyloroplasty surgery is performed by a general surgeon in a hospital or medical center operating room . How will this surgery be performed? Why must I have the surgery? What are my options if I opt not have the surgery? What are my chances of getting this condition again? What can I do to avoid getting this condition again? this was the other surgery performed at the same time as the vagotomy...interesting...but all medical personnel I've consulted have been aware of this. I am scheduled to have surgery. My digestive system has been out of whack for some time and the doctors have concluded that the surgery is necessary. It seems the opening in my stomach that leads to the rest of my digestive system is too small and will be enlarged. I have read the article. I also am familiar with this proceedure. I am a Reg. Nurese with 40 years of surgery experience. My question is: My wife has had radiation and chemo treatments for Adult Wilms Tumor in 2000 and 2001. She had the Lt kidney removed, a G.B. Removed, and a Lt Hemicolectomy. Since then a gradual shift of the stomach has taken place. She now gets periodic episodes of a Sm. Bowel obstruction. Each episode is closer together, lasts longer, and she is less able to tol. solid foods. We have been through the mill of tests, exams, CT scans, MRI's, Consults etc etc.. We need some answeres as to whether this proceedure (pyloroplasty will help to straighten out a shifted stomach, which in turn cincks the pyloric valve, and the sm. intestine. Plrease refer me to the EXPERTS on this tough and difficult issue for my wife and I.
im concidering this proceedure; i had vbg done in 1994 now have complications food not digested and vomiting hours post ingestion. I am considering this procedure following pyloral dialatation [which was unsuccessful]. My question is regarding 'dumping' which I have been warned may result. What does dumping mean for day-to-day living? How debilitating is it? does it get better with time? Any comments would be very welcome. I am being considered for a pyloroplasty and vagotomy for PUD and now the doctor is asking me to have an ultrasound of my pancreas but cannot give me a reasonable explanation as to why the pancreatic ultrasound must be done. Can you explain? i have had gastro for 3 years now, and i was wondering if this would be safe to do? , my stomach doesn't work like it used too, it's seems to be getting worse too, i have nausea all thee time. i'm tired of it. would this surgery help some? About 10 years ago I had stomach surgery, possible pyloroplasty for PUD. The surgeon told me in order to cut the Vegus nerve he had to remove my spleen, was this necessary or a mistake? I still have the dumping after this many years. I found out that I can drink red wine with dinner, but no other liquid, have not tried any other alcohol drinks like beer etc. I am suffering gastratis last twenty years. doctor has given lot of medecine to reduce the acid secretion but now medecine is not and can't control my burning in stomach. I am only 40 years old and now I am taking Lansoperazole-30mg three time and with sucralfate and domperidon. but the result is zero. i have done endoscopy four time but did not find out any ulceration in my stomach. So What i should do??? some time I think to do highly selective vegatomy. Would please advice me how control my irritation. I am very very worried because I have sdmall two sons. i can't work properly. I am waiting for your good advise sir. Before the knowledge of bacteria causing ulcers, i had surgery for them, after suffering sever pain for a year, caused by constant stress in marriage. They were concerned I might have cancer so did an explorative surgery. They told me I had had two ulcers the size of quarters, and they did a pylor plasty and vegotomy. I had several gas and dumping after. Through the years seemed kind of ok, but always trouble with digestion. Today I am 89 to 93 pounds in weight & 5'4" and suffer from weakness, and mal nourishment, dizziness and have not led a normal life for two years because of this and dizziness. I recommend looking at your life, taking care of eating right, read and study because surgery is only a band aid you have to give your body a chance to function and even heal itself. I am very sorry I had this surgery and wish I had changed my life and taken the stress away instead. Every individuals problems are different- but it is meant to have the enzymes in the stomach and those are non existant after a few years with the surgery. I found I was starving to death. Enzymes have helped me with the pain and discomfort lately. Hi. I am 38 years old. 2 years ago I had to have a vegotomy done due to a duodenal ulcer. I was always having pain in my stomach and everything I ate I would throw back up. The dr removed over half my stomach and over half my intestance. A while back, it all started over again. Every single day my stomach burns and hurts and no matter what I eat, I can't keep it down. I have made a appt. with my dr but I am curious to know if anyone knows what he will probaly do this go around?? I am already missing over half my stomach and intestance so I'm wondering if it's even possible for him to do another surgery. I am just so tired of feeling the nausea all day and throwing up when I eat. If anyone has any advice, please let me know. Thank You. Hi, i do pyloroplasty and vegotomy in this week because of Gastric rupture due to sudden disruption. Now i have question about my diet after surgery. I loss 4 kg of my weight. I dont know what kind of foods are good for me now. Plz help me. I had the vegotomy and pyloric plasty when I was 24 and i know my surgeon widened the pyloric valve. I also had my gallblader I am now 65 and a cat scan of my abdomin showed i have prominent dilation of the intra-and extrahepatic biliary tree and pancreatic duct down to the level of the sphincter bone. Now i am scheduled for a ERCP. I wonder if it is a result of the surgery i had when i was 24. Anyone know? The surgery worked and i can eat most things, so it was a good thing for me. But of course now i am worried about this finding. i am 74 and had the Pyloroplasty when I was 24. Have not had a lot of dumping syndrome. That improved when I quit drinking alcohol and smoking. My health has been great until recently I started experiencing heartburn. My doctor has prescribed an antacid for me. I question taking this because the surgeon who did my procedure has since passed away and I recall him telling me after the surgery not to take antacids. Can anyone help me with this. Modern doctors do not agee with him. Any help on this would really be appreciated. To prevent from PUD, what are the things required ?? I had this pyloroplasty surgery done to help me with gastroparesies. Sense the surgery I have lost thirty pounds unable to get any weight back, lots of fatigue, and relentless headaches. Has any one experienced headaches with this procedure? My son had this operation six weeks ago due to gastroparesis. He's back in hospital due to it failing. Is there anything else that can be done? My son has to be on gastric free drainage 24/7 and has dual jejunal feeds of his milk and dioralyte to replace the gastric losses. Hi Dawn, i dont know if this helps. But i myself just had a pyloroplasty and nissen fundoplication w/hurnia removal 3 weeks ago. Ive had crohns disease for 18 years now. I am the youngest at my drs office. Not as young as your son, but my troubles bagan around his age. Personal experience its hard to find to much to relate to and you start to feel like a burden, so i commend you on being a good caring mother. As far as healing, i still have 6-8 weeks , im still feeling abdomen pains and tons of gas pains in my chest and upper abdomen, even my neck. They say im not supposed to be able to burb or vommit, however ive done both since my procedures and it is painful to do so. My swelling is hard to get under control considering i cannot take alot of medications and what i do take has to be crushed or iv. But with time i hope things eventually heal, and your son is in my prayers.